Tickets are now off sale – please contact the organisers if you would like to go on the waiting list. The Birthday Lunch is a traditional part of the annual Shakespeare Birthday celebrations. 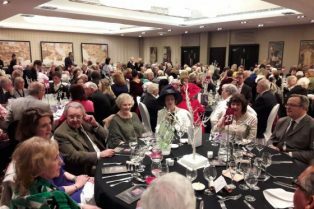 The 2019 lunch will be held on Saturday, 27 April at the Crowne Plaza hotel in Stratford-upon-Avon. There will be a sparkling wine reception at 12:30pm and lunch will be served from 1:00pm. A three-course lunch will be provided, with tea or coffee afterwards. There are cash bars at the hotel and drinks can be ordered in advance by contacting the hotel. Full details of the menu, with vegetarian options, will be available nearer the time. There will be speeches and toasts including the presentation of the annual Pragnell Award for “outstanding achievement in extending the appreciation and enjoyment of the works of William Shakespeare and in the general advancement of Shakespearian knowledge and understanding”. The winner of the 2019 Pragnell Award, who will be introduced by Professor Michael Dobson, the Director of the Shakespeare Institute, is Professor Jerzy Limon OBE, the highly-regarded theatre historian and founder of the Gdansk Shakespeare Festival in Poland. This year’s after lunch speakers will also include Erica Whyman of the RSC, Tim Cooke of the Shakespeare Birthplace Trust and the arts journalist and broadcaster Paul Allen. The event is expected to finish before 4:00pm. Prior to the lunch, optional boat transfers on the River Avon, from Holy Trinity Church to the hotel will be provided, organised by Bancroft Cruisers. Tickets are available through the RSC box office (Tel: 01789 331111 and the link to the website is: https://www.rsc.org.uk/buy-tickets/items/shakespeare-birthday-lunch/43642. Tickets for the lunch cost £43, or £49 for lunch plus the boat transfer. The organisers Alan and Ros Haigh can be contacted by email at alan@birthdaylunch.co.uk in case of queries.